The culinary style of Rajasthan is one that is sure to send your taste buds flying over the horizon. The arid climate and scarcity of water has had an effect upon the cuisine of Rajasthan. These have led to witness the evolution of food habits that a lot of their dishes can be stored for days together and consumed without heating. The region’s royal heritage and the gastronomic energy of the locals have led to a wide variety of exquisite and delectable dishes that range from tickling spicy foods to sweet snacks. 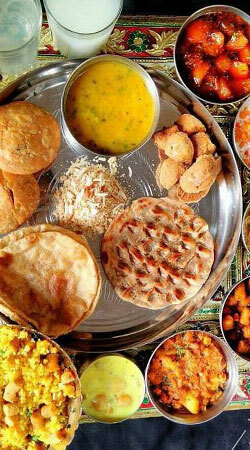 If you are a food lover, then the Rajasthani cuisine is a gateway to a haven of food for you to try on. From the much famed Daal-Baati-Churma to the spicy Golgappa in the streets Rajasthan has something and more to offer for your taste buds.